Golf is a game that many people love to play. For many golfers, it is not always convenient to go to the practice range all the time. For this reason, these golfers would love to have the opportunity to practice in their backyards. For many years, this was not possible until the Rope It Golf Training balls came onto the market. No longer do you have to trek miles to the golf practice range. You can practice in the comfort of your own property while improving your golf game. 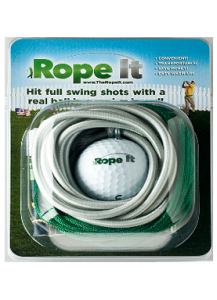 The Rope It golf training ball is specifically designed to help golfers like you to improve your golf game and it does not matter if your backyard is small or large. Size doesn’t matter since the training ball is attached to a rope and so the golf ball cannot escape into the neighbor’s yard or hit anyone passing by. With the Rope It golf training ball, you can practice our golf swing with the intention of making your game much better than it was before. This training ball is lightweight and you can take it anywhere with you – to the soccer field, park and golf course. You are able to see the path of the ball when you hit it. For that reason, you get to improve your hook or slice because you can actually analyze the swing from 20 yards away. The Rope It golf training ball when it is hit goes in a straight path for you to easily see it. This practice ball is uniquely designed with a bungee cord and nylon rope, which works in a calibrated fashion to provide a full golf swing. You don’t have to be consistently losing your golf balls as you would on a practice range. Moreover, it doesn’t matter if you are a beginner golfer or veteran to use this golf ball. Fred is an avid golfer and physician, but he also has a busy medical practice. He loves to play golf and so was very happy when he heard about the Rope It golf training ball from his golf buddy, Mark. He decided to try it and was even more pleased that it hit like a real golf ball. This was precisely what he needed. He could practice in his backyard without disrupting his busy work schedule. In fact, the golf ball helped Fred in all aspects of his golf swing, especially when hitting down and making contact with the ideal spot on the golf club’s face. Fred doesn’t live on a driving range so this Rope It golf training ball was the perfect option. Like Fred and Mark, you too, can experience what the Rope It golf training ball can do for you. If you want to improve your golf game, then this is the perfect choice. For an affordable price, go to That Training Ball to buy your Rope It golf training aid.